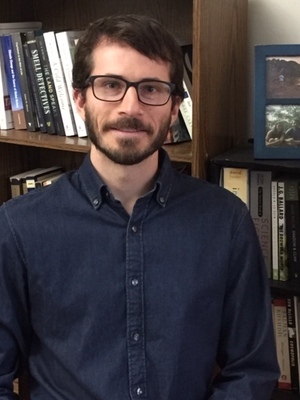 Andrew Bishop is a PhD student who studies nineteenth- and twentieth-century American literature. He researches how a range of different historical phenomena associated with modernization, like mass consumerism and commercial travel, reshaped ecosystems as well as American literary conceptions of nature and animality. Prior to pursuing his PhD, Andrew coordinated the Composition II program at Hudson County Community College. His reflections on pedagogy can be found in The Concord Saunterer and the Community College Humanities Review. "Wasted Bulls and Fungus-Ridden Fish: Waste, Tourism, and Entitlement in Ernest Hemingway's The Sun Also Rises," forthcoming in The Hemingway Review. “Literary Cures for Common-Sense Thinking in the Composition Classroom.” Community College Humanities Review. vol. 2, no. 2, spring 2018, pp. 64-71. "Chatting about 'Nature' with Henry Thoreau and William Cronon." The Concord Saunterer: A Journal of Thoreau Studies, vol. 25, 2017, pp. 146-148.